The Roswell UFO crash case has been solved - yet again. Nick Redfern, writing in his new book, Body Snatchers in the Desert, has proposed a somewhat new but not extraterrestrial explanation. He suggests that what fell in Roswell was an American high-altitude experiment that contained the deformed and mutated bodies of Japanese captured at the close of World War II. The object that carried them was a huge balloon modeled after the balloon bombs launched during the war and a wooden flying-wing-type craft designed by the German Horten brothers that was taken from the Nazis. Redfern suggests that those who found the wreckage, the officers at the Roswell Army Air Field, did not immediately identify the craft because of the weird construction, the aluminized rubber that made up the balloon, and other elements that seemed to defy easy explanation. The craft had carried five pilots (or possibly four), all killed in the crash. As the strange contraption broke up, a segment about nine meters long had fallen away. One of the pilots was sucked out the craft as it came apart, and this is what Mack Brazel found on the ranch he managed near Corona, New Mexico. This experiment, designed to expose the captured Japanese to high altitudes to find out what would happen to the human body, could not be revealed to the general public. At the time, July 1947, the United States was trying Nazis in Nuremberg for crimes against humanity. Some of those crimes included experimentation on human subjects without their consent. Now, according to Redfern's theory, the United States had done the same thing. It would be the height of hypocrisy if the United States were engaged in the same sort of human experimentation. Redfern's hypothesis does explain, to some extent, the various aspects of the Roswell case. It has a nice theory for the two crash locations; it explains why the government, in this case the military, would work so hard to hide the facts even today; and it explains the small bodies claimed to have been seen by so many of the witnesses in the Roswell case. However, I'm not sure why the Horten Brothers flying wing designs have been dredged up again. During the 1930s and 1940s, these two German brothers worked on what were thought of as tailless aircraft. They had 10 or 12 different designs, some of which crashed after only a few flying hours and others that were thought to have been scheduled for mass production but never were. The Nazis needed a long-range bomber that could reach the United States, and one or two of the Horten brothers' designs were supposed to have had the range. At the close of World War II, the Horten brothers' aircraft plants were overrun by the Soviets. Nearly everything was carted back to the Soviet Union, and there was speculation that the Soviets would build as many as 1,800 Horten flying wings as a bomber force to counter the United States' buildup of long-range strategic bombers. Four of them are now back in Germany for restoration, with one to remain there when the work is finished, while the other three rejoin the collection of the National Air & Space Museum. A restored Horten sailplane is on display at Planes of Fame in Chino, California, which also owns a Northrop N-9M, a technology demonstrator roughly the size of the Ho 299, but much less sophisticated. Construction of the H IX V3 was nearly complete when the Gotha Works at Friederichsroda was overrun by troops of the American 3rd Army's VII Corps on April 14, 1945. The aircraft was assigned the number T2-490 by the Americans. The aircraft's official RLM designation is uncertain, as it was referred to as the Ho 229 as well as the Go 229. Also found in the destroyed and abandoned works were several other prototypes in various stages of construction, including a two-seat version." The V3 was sent to the United States by ship, along with other captured aircraft, and finally ended up in the General H. H. "Hap" Arnold collection of the Air Force Technical Museum. The all-wing aircraft was to have been brought to flying status at Park Ridge, Illinois, but budget cuts in the late forties and early fifties brought these plans to an end. The V3 was handed over to the present-day National Air and Space Museum (NASM) in Washington D.C. 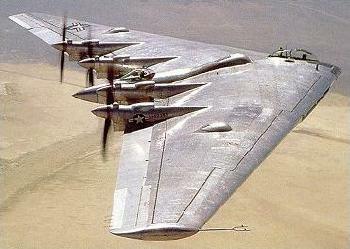 In the United States there was a similar flying wing project created by Jack Northrop prior to World War II. The plan also called for the development of a long-range bomber, but other priorities and technical problems kept it from completion. After the war, a four-engine version was created that flew a number of times. In June and July 1947, these aircraft were grounded with gearbox problems, effectively removing them as one explanation for the flying saucer reports made at the time. Although the Northrop flying wing was suggested as a possible source of the Roswell debris, there was never any evidence that it was. Some believed the flying wing might have been responsible for the sighting of nine strange objects onJune 24, 1947, by Kenneth Arnold that launched the modern UFO era. But again, the craft were grounded at the time and there were fewer than nine of them in the arsenal. One of the Horten brothers' designs known as the Parabola certainly looks like the object Arnold sketched in the years after his sighting. The problem is that the first drawings Arnold made, in the days after the sighting, look little like the Parabola. And, again, there is no evidence that any of the Horten designs were brought to the United States, or that anything designed by the Hortens was built here. That takes us back to the Japanese, and what were called the balloon bombs. Starting in 1944 and continuing into 1945, the Japanese launched about 9,000 of these devices. The Japanese had discovered the jet stream and realized that a balloon launched in Japan would reach the Western Hemisphere, most probably the United States, in two or three days. If they put bombs on the balloons, along with some instruments, they could conceivably attack the United States. The trick actually worked. Balloons launched in Japan rose during the day and fell during the night. Sandbags were attached and programmed to drop if the balloon dipped too low. This way it maintained its altitude. After cycling two or three times, the bombs would fall. The Japanese knew that the odds were that the bombs would not hit a city, but did make plans to drop incendiary devices in the Pacific Northwest, hoping to start forest fires. Records indicate that about 250 balloon bombs reached the Western Hemisphere, falling as far north as Canada, as far south as Mexico City, and as far east as Michigan. Any damage done was of little consequence. The U.S. Office of Censorship, a wartime creation, working along with the FBI, suppressed the story during the war. They believed that Japanese spies, seeing the public information, would report home, telling of the success. That would increase the number of balloons launched. The censorship worked well, but was changed when six people in Oregon - a woman and five children on a picnic - were killed when a bomb detonated. They had found one of the balloons lying in the forest and pulled on it, causing one of the bombs to explode. At that point a "whispering" campaign began to alert the population about the bombs. While the ingenuity of the project can't be questioned, it was still a balloon. The technology to create the balloons wasn't special, and in fact, wasn't all that advanced. There is no reason to suspect that Japanese balloon technology was married with Horten flying wing technology to create some sort of hybrid. This wasn't the first time that such a theory had been suggested, at least in general terms. Back in the early 1990s, as I began my research into the Roswell crash, I interviewed a man who worked with NASA at the White Sands Missile Range. Gerald Brown suggested that experiments using the A-9, a two-stage modified V-2 rocket, might have been responsible for the debris found by Mack Brazel. He believed that Duraluminum might explain the lightweight, thin metal that had been described by Roswell Army Air Field intelligence officer Maj. Jesse Marcel, Sr. In fact, Brown had an explanation for everything found on the ranch with the exception of the bodies. He did speculate, suggesting that some kind of flying wing had crashed while carrying five chimpanzees dressed in silver flying suits. Since the experiment related to the space race, and since launch operations at White Sands had been closed down because of an accident in May 1947, those involved hid their mistake. They feared for their jobs. All this was laid out in my book, UFO Crash at Roswell. The problem here was, again, no flying wing was missing from the inventories, there was no record of such a launch at White Sands (though the records did exist for the period), and there were no reports that animals had been killed in the tests. A year later, as experiments were designed and made to test the rigors of launch physics and the dangers of upper atmosphere flight, animals were launched. Those records also exist. Rumors and stories of experiments pre-existed the revelations of Redfern. In fact, I have told many people that if I could find evidence of an illegal experiment that resulted in the deaths of human subjects, it would be a much bigger story, at least in terms of what the journalistic community would be willing to believe. Too many reject the idea of an alien spacecraft crash out of hand. But discover, and prove, some sort of underhanded experiment by the government, and nearly everyone would jump on board. The problem for me was the lack of anything substantial. The records that I had examined at White Sands, in Alamogordo, at the National Archives, at the Southwest History Museum in Roswell, and at the universities and government offices in Albuquerque and Santa Fe revealed nothing to lead in that direction. Then there was the debris described by the witnesses, including Jesse Marcel, Sr.; Bill Brazel, son of Mack; Loretta Proctor; and Sallye Tadolini, whose mother, Marian Strickland, had been a neighbor of the Brazels in the summer of 1947. If we stick to these descriptions, then a terrestrially manufactured machine, even an experimental craft, seems less likely. In an interview conducted in February 1989, Bill Brazel told me about the exotic debris he had found on the ranch: "The only reason I noticed the foil was that I picked this stuff up and put it in my chaps pocket. I had it in there, two, three days and when I took it out and put it in the box I happened to notice that it started unfolding and flattened out. ... I would crease it and lay it down and watch it." Brazel also described a small piece of debris as light as balsa wood but incredibly strong. He tried to whittle on it, but couldn't even get a sliver, suggesting something much tougher than anything used in a balloon. He mentioned something like fiber optics: "Now there's this plastic they put a light down one end and it transfers the light down that thing and come out the end." None of the items he described (other than fiber optics) appears in today's world. Brazel's father Mack told him, "That looks like some of the contraption I found." That statement connected the strange debris to the descriptions of the others, such as Jesse Marcel. Sallye Strickland Tadolini was a young girl in 1947. Bill Brazel, about a decade older, showed up at the Strickland ranch house a few days after the crash. He had the strange foil with him and let the others look at and play with it. Tadolini, in an affidavit for the Fund for UFO Research, described it this way: "What Bill showed us was a piece of what I still think of as fabric. It was something like aluminum foil, something like satin, something like well-tanned leather in its toughness, yet it was not precisely like any one of those materials. While I do not recall this with certainty, I think the fabric measured about four by eight or ten inches. ... Bill passed it around and we all felt of it. I did a lot of sewing, so the feel of it made a great impression on me. It felt like no fabric I have ever touched before or since. It was very silky or satiny, with the same texture on both sides. Yet when I crumpled it in my hands, the feel was like that you notice when you crumple a leather glove in your hand. When it was released, it sprang back into its original shape, quickly flattening out with no wrinkles. I did this several times, as did the others." The others told similar stories of the material. Loretta Procter said they tried to burn a small piece, about the size of a pencil, and failed. Jesse Marcel, Sr., said they hit a larger, metallic piece with a sledgehammer without doing any damage or marking the metal. This body of firsthand testimony suggests that the debris found near Roswell was something extraordinary. The elements - foil that would return to its original shape without sign of a wrinkle or crease, extraordinarily tough metal that was as light as balsa but so strong that it wouldn't cut or break like ordinary metals, and something that sounded suspiciously like fiber optics at a time when no such thing existed on Earth - suggest the extraterrestrial. Redfern's theory hinges on the integrity of his anonymous, but alleged firsthand witnesses. Once, five or six years ago, there were a number of stories told by such witnesses about themselves, about what they had seen, and about alien bodies. Frank Kaufmann talked in detail about these things, as did Gerald Anderson, Jim Ragsdale, and Glenn Dennis. Kaufmann offered copies of official documents to prove who he was. He had a letter that, if authenticated, proved Roswell had been a spaceship crash. Redfern, in an interview conducted for UFO Review said that the witnesses he refused to name had proven who they were by documents in their possession. To Redfern, this is proof that they are who they claim to be and that their tales can be trusted. Yet the same could be said of Kaufmann. His documents looked authentic, and they were, after a fashion. Only after the originals were found could we see the alterations he had made to the copies he had given us. He'd used whiteout and a copy machine to forge documents to support his claims. Unless the original is available for scrutiny, documents are of little value. As Frank Kaufmann said, "The Xerox is as loose as a goose." Indeed, it is simple to forge documents in the modern age. Redfern uses some of the Kaufmann testimony to bolster his case, seemingly unaware that Kaufmann invented his role in Roswell. If Kaufmann made up everything and had no role in the Roswell case, then where does that leave Redfern? He used Kaufmann's description of the craft to bolster his flying wing theory. Since we know that Kaufmann was inventing his tale, his testimony does nothing to support Redfern's theory. If Redfern is wrong, and this wasn't some horrendous and illegal experiment, what is the answer? It's the same as it has been for the last two decades. It was extraterrestrial. Redfern has suggested that his answer makes sense because he can find no documentation to support it. He reasons, with some logic, that those conducting the experiments, knowing that they were illegal, destroyed the evidence when they finished. The files were shredded, the remains of the craft were dismantled and burned, and those with knowledge were cautioned never to mention it to anyone. Redfern tells us that an extraterrestrial craft would not lend itself to such a cover-up. Because the biological samples (alien bodies), the craft, and its components were unique, they would be preserved so that information could be gathered from them as our technology advanced. Indeed, logic argues in favor of this scenario: destruction of everything related to the case if it was an illegal experiment and preservation if it was extraterrestrial. But there are other aspects that take us in the direction of the extraterrestrial. First is the credible eyewitness testimony about the surprising and unusual characteristics of the various materials recovered on the field northwest of Roswell. Clearly, these were things that were beyond the technology of the times and, in fact, some of them are beyond our technology today. Second is the testimony of the witnesses who were on the scene. Jesse Marcel, Sr., said that this was something that came to Earth from elsewhere. As an air intelligence officer, he was in a position to know all there was to know about Earth-based craft. He knew about balloons and experimental aircraft, and he was convinced that what he found was none of those things. Third is the testimony of Major Edwin Easley, the provost marshal at the base. In a conversation held about a year before his death, I asked him if we were following the right path. He wanted to know what I meant by that, and I said that we thought it was extraterrestrial. "Let me put it this way," he said, "it's not the wrong path." Patrick Saunders, who was on Blanchard's primary staff in July 1947, also confirmed the extraterrestrial nature of the crash. Although he was always reluctant to talk about his involvement in the retrieval operation with UFO investigators, he did buy copies of UFO Crash at Roswell. He sent them to friends and family who asked him questions about the crash. On the flyleaf he wrote, "This is the truth and I never told anybody anything." Roswell was not some rogue experiment using deformed and mutated Japanese captives, but the crash of an alien spacecraft. Those who were there would have recognized everything as terrestrial if that's what it was. The only answer that takes all the evidence into account is that this was truly something from another world. Kevin Randle is a former army helicopter pilot and Air Force intelligence officer, an active national guard member, and a UFO researcher who has been writing about the phenomenon for three decades. He has written or co-written numerous books on the subject, including UFO Crash at Roswell, The Truth About the UFO Crash at Roswell, and A History of UFO Crashes. Kevin Randle's review of my book, Body Snatchers in the Desert: The Horrible Truth at the Heart of the Roswell Story, makes a number of comments and observations. Randle's statements regarding the work of the Horten brothers are noted, but are not entirely crucial to the story, primarily because all of the interviewees told me that the aircraft that crashed at Roswell was based upon Japanese designs that were Horten-inspired, or Horten-like. But they were not built by the Hortens. As Randle notes, in the 1940s the Germans were working with flying-wing-type aircraft (as per the Hortens), and so was the United States (with Northrop). But I specifically point out that even though there was some likely collusion between the work of the Nazis and that of the Japanese, the device that came down at Ros­well - according to the people I interviewed for the book - was Japanese and not German. Randle says that the book provides a "nice theory" for the allegations that there was more than one crash site for the Roswell vehicle. It does. And we could argue that the reason why the theory is so "nice" is because it is the literal truth. Randle disputes the possibility that the Japanese would have worked on postwar Fugo balloons that might have resulted in the creation of a hybrid-style device that was a blend of huge balloon array and flying wing. However, there is evidence to firmly demonstrate that the Japanese were working on far more ambitious balloon-based projects than the wartime Fugos. For example, U.S. newspapers of 1945 talk about the Japanese planning to build far larger balloons that would have had a fully-pressurized gondola affixed to them piloted by "death-defying Japanese" for a manned assault on the U.S. mainland by balloon, after a four-day, high-altitude flight to the U.S. Though Randle disputes the data contained within the book, he admits to speaking with a former White Sands employee who informed him of a theory that may have explained the unusual debris, and that may have incorporated a flying-wing-style vehicle in the accident. Randle states that the complete lack of official documentation in favor of this theory renders it unlikely at best. However, Randle supports the extraterrestrial theory, for which there is also a complete lack of official documentation. One might ask: why does this lack of documentation offer greater support for the ET scenario? The issue of the debris found at the Foster ranch and examined by a number of people - including Maj. Jesse Marcel - is certainly intriguing, and is one of the key aspects of the story that keeps people looking into it. Yes, we have a lot of testimony that the debris was of an unusual nature. But consider the following: the only pictures we have of Marcel are with what is obviously balloon debris. The rancher, Mack Brazel, had previously found two balloons flown by the military on the same property. Brazel's daughter, Betty, said that: "The debris looked like pieces of a large balloon which had burst." It was also in this period that polyethylene balloons - laminated with aluminum - began to be used. Even the Air Force stated that the descriptions of the debris that, when wadded into a ball, would resume its original shape, "are consistent with the properties of polyethylene balloons laminated with aluminum." The biggest problem with Roswell is that it occurred nearly 60 years ago, and practically everyone involved is now dead. The people with whom Randle spoke, who made seemingly pro-ET comments, either made very cryptic statements and are now dead (Easley) or made a one-sentence statement in a book (Saunders). How do we know that both men were not fed the "it was alien" line to further bury the truth, if anyone - such as Randle - came asking? I am certain that Easley and Saunders were not lying. But in the hall of mirrors known as Roswell, they may have been lied to by their superiors about the nature of what crashed at Roswell. As evidence of this, my book includes a whole chapter ("The Crashed UFOs That Never Were") that details several occasions upon which the U.S. military and intelligence community deliberately spread bogus crashed UFO tales for disinformation purposes. A thought to close on: If such disinformation could (as I show in the book) be applied at Aztec, New Mexico; at Spitzbergen, Norway; and at Kingman, Arizona; then why not at Roswell, too? Roswell: New Explanation, or new disinformation? Nick Redfern has written several important UFO books and has spent time at many archives in gathering information that the armchair theorists don't bother with since their primary approach is "Don't bother me with the facts, my mind is made up." I read the book with expectations that something new had really been turned up about Roswell. Nick has talked to a number of people who told him interesting and complicated stories that supposedly lead one to the conclusion that the so-called Roswell Incident did not involve an alien spacecraft or a Mogul balloon or a weather balloon radar reflector combination. Instead, what crashed was a Horton Brothers Flying wing supported by a huge Japanese-designed balloon and containing disabled or genetically damaged Japanese who were used as human guinea pigs to provide data on the effects of radiation for use in the NEPA Program. NEPA stands for Nuclear Energy for the Propulsion of Aircraft. There was indeed such a program beginning right after the war with Fairchild Aircraft and Oak Ridge National Laboratory in Tennessee. There were serious concerns about how the world would react to the use of human subjects especially in light of the Nuremberg trials which revealed many unethical Nazi medical experiments on human subjects. People were kept in pressure chambers to see how long they could withstand low pressures. They were kept in freezing water to see how long they could stand the low temperatures. Obviously pilots at high altitude might be inadvertently subjected to low pressure in the case of accidents. Unspeakable things were done to people many of whom would have died in less agony in gas chambers. Unfortunately, Nick focuses on the testimony of whistleblowers. His major source, the Colonel, apparently approached him at the Crash Retrieval Conference in Henderson Nevada in November 2003.We don't know who he is or how carefully he has been vetted. A second source was a woman, the Black Widow, who claimed to have worked at Oak Ridge National Laboratory and to have been aware of bodies being used for terrible experiments and that these were the ones found at Roswell or perhaps the Plains of San Augustine. We don't know who she is or how much evidence has been directly obtained to validate her story There were other sources such as Salter and Barker. The Colonel certainly had a lot to say,.even if we don't know which of any of his many claims were true. He seemed to be familiar with the history of UFOs in the USA and aware of the primary people in the field. There unfortunately have been a number of whistleblowers whose testimony has been shown to be baloney including Robert Scott Lazar, Frank Kaufmann, Guy Kirkwood, Michael Wolf Kruvant, and others such as Lt. Colonel Philip J. Corso almost none of whose claims had been substantiated in the book The Day After Roswell. Nick has also been given a bum steer about the NEPA project and the radiation shielding problems associated with it. He states that the project was cut back in 1957 and finally cancelled in 1961 after President Kennedy took office. In actuality, the GE ANP (General Electric Aircraft Nuclear Propulsion program) was at fullest bloom in the 1956-1960 time frame. I know because I worked there in the Radiation shielding unit as a nuclear physicist from September 1956 until November 1959. The budget for 1958 alone was $100,000,000. 3500 people were employed full time of whom 1100 were engineers and scientists. This was far more money and manpower than was spent at Fairchild and Oak Ridge in the late 1940s and early 1950s. Nick keeps referring to concerns about radioactivity and contamination. These were not the shielding concerns. Instead, it was the neutrons and gamma rays emitted by the reactor that were of concern. Usually split shielding was to be used with some all around the reactor (typically under 3 feet long and 5 feet in diameter) and more placed between the crew compartment, typically far ahead in the airplane, and the reactor. There was also serious concern about both neutrons and gamma rays leaving the reactor shield assembly in directions other than towards the crew, but being scattered by both the atmosphere and structures past the crew shielding. An ANP system has to operate at much higher temperatures than do ship reactors and radiation heating in the shielding is a major problem. GE was working on a direct cycle system in which air goes from the jet engine compressor to the reactor and is heated to temperatures around 1800 °F and then exhausted through the turbine to create thrust. In terrestrial applications of nuclear energy one can use lead to provide shielding against the very penetrating gamma rays and polyethylene or other materials containing hydrogen to shield against neutrons. One also prefers to capture the neutrons slowed down by the hydrogen in something like boron which emits a big alpha particle which doesn't go anywhere. All too often neutron capture in many metals and in air results in the creation of more energetic gamma rays. For ANP lead and plastic have much too low a melting point. Lead which has a specific gravity of only 11.3 grams per cc would require a large thickness and since the weight goes up rapidly of material around a cylinder with increasing thickness, one would prefer a much denser material such as an alloy of Tungsten which has an SG of 19.3 and a very high melting point. The question than becomes what standard should be set for the allowable doses of neutrons and gamma rays to the crew and how to meet the weight limits. Unlike in a nuclear bomb blast where the exposure is very high for a short time, crews of a nuclear airplane would be expected not to have degradation in the their performance over a long period of time. One of the major benefits of an ANP system is essentially unlimited range because the reactor would not be refueled for thousands of hours. An important factor here is that animals including humans have built in mechanisms for repairing the damage caused by radiation. Thus a high dose taken in a short time will be much more damaging than the same total dose in an exposure lasting for weeks or months. Nick does point to various human tests of aviation biology associated with planes flying higher and faster, how to bail out at high altitude and speed without freezing, how to provide protection against excessive acceleration, low air pressure, low temperatures at altitude, cold water when winding up in the ocean. However he never mentions that there was a lot of research being done on biological effects of radiation because of the need to know how quickly ground crews could go in on a battlefield on which a nuclear weapon had been exploded. How high would radiation levels be in aircraft that had either dropped a nuclear weapon or had to fly near the mushroom clouds of a weapon dropped by somebody else? There are many different tests that can be run such as with animals in enclosures exposed to radiation sources (gamma rays only) in an open field. There are few useful sources of neutrons other than an operating reactor. One can feed animals radioactive materials to increase the internal radiation levels. Millions of medical tests are done every week with the administration of specific radionuclides to test body functions such as the kidneys or thyroid. Obviously one wants the half life to be short. Many humans were exposed to Plutonium, which despite the terrible press, it has had, did not result in noticeable life shortening. There was a major effort made to determine the radiation exposures of the Japanese exposed in 1945 at Hiroshima and Nagasaki from the bomb itself and then later from fallout. Doctors have to know how much radiation people can handle without severe damage when being treated for cancer using either an accelerator or a radioisotope such as Cobalt 60. Of particular importance is that Nick never mentions William Randolph Lovelace who was head of aviation biology for Wright field during World War II. Afterwards he was on their Aviation Biology Committee while back running the Lovelace clinic. He even jumped out of an airplane at 42,000 feet to determine how soon one should open one's parachute without freezing to death on the way down. He and his family had founded the Lovelace Clinic in Albuquerque to be kind of the Mayo Clinic of the Southwest. They had many government contracts to evaluate animals such as sheep which had been exposed to radiation. They did a lot of classified work for the government. I believe that they would have done some initial evaluation of the bodies found near the crash on the Brazel ranch and in the Plains. They had the competence, were close by, and had the security clearances. To test shielding materials one places them in various combinations adjacent to a known source of both neutrons and gamma rays and measures dose rates within the assemblages and outside of them. Two different kinds of shielding tests were run to evaluate the effects of scattering and the production of so-called secondary gamma rays by capture of some of these neutrons. Several flights were made with a modified huge B-36 bomber in which a small low power water cooled nuclear reactor (called ASTR for Aircraft Shield test reactor) was operated and measurements were made as a function of altitude within a heavily shielded crew compartment and in chase planes flying nearby. The reactor had absolutely nothing to do with the propulsion of the B-36. The flights originated at Convair, Fort Worth, Texas, which also had a small similar reactor in a rotating test facility in which various arrays of materials could be placed. The reactor was operated by Convair people who were paid by GE to run the tests. I spent months there as the GE Rep specifying the arrangements of often exotic test materials to be evaluated. There were also tests conducted on various engine alloys to see how radioactive they would become when exposed to neutrons. There was also built at Oak Ridge a Tower Shielding Facility with four tall towers. A reactor shield assembly could be hoisted up well over 100 feet along with a crew compartment and measurements made as a function of altitude (to avoid the effect of the ground) and separation distance. Nick is clearly aware of the testimony of Major Jesse Marcel of what was observed on the Foster Ranch and of Barney Barnett in the plains of San Augustine. A big Japanese balloon and a Horton flying wing don't fill the bill. Most Horton craft were actually made out of wood, but there was nothing about the wing and balloon that matched the eyewitness testimony and the complete absence of conventional components as noted by Jesse — nor the huge area covered by the small pieces of wreckage. Nick accepts the testimony of the late Frank Kaufmann about the shape of a saucer from north of Roswell. He seems unaware that Frank's original testimony about the shape seems to have been taken from a drawing on the cover of Popular Mechanics of the TR 3 airplane, and that Frank's testimony has been totally discredited, even by his formerly staunchest proponent, Dr. Kevin Randle. I am reminded of a call I received from a man claiming that, when he was young, he saw a picture on the front page of a certain Alabama newspaper showing the Roswell crashed saucer and alien bodies out in the NM desert. He even remembered the name of the librarian who let him look at the newspapers. I checked with the paper. As I expected, it indeed had a picture dealing with Roswell on the front page — one of those taken in General Ramey's office. No saucer and no bodies. I think he believed what he told me to be true. It wasn't. The analogy comes to mind of a brick building that has just been demolished. Lots and lots of bricks. Without any other knowledge, one could obviously construct a wide variety of different structures. Nick has collected a lot of bricks. The picture he has constructed doesn't seem to match the facts obtained from witnesses. It may well be that the Colonel and the Black Widow really believe they were telling the truth. I think it is just as likely that one or both were providing disinformation. If it doesn't fit, one must acquit. I think it’s important to interact with Stanton Friedman’s review. Stanton’s stature and expertise in this area are unquestioned. However, I believe that his dismissal of Nick’s position is hardly on firm footing, being built on inconsistent reasoning and deflecting attention away from the most salient details. But before getting into the details, an overview is in order. 1. The Japanese Fugo balloon program – This program involved the use of experimental high altitude balloons as weapons. The goal was to launch these balloons from Japan in such a way as to ensure that they would be carried by the winds over the western United States. The intended payload on these balloons were lethal biotoxins. 9,000 such balloons were launched in the initial phase of the plan, complete with ingenious explosive devices. A few reached U.S. soil, and there were a few casualties. The press wisely obeyed military gag orders on these events, and so the Japanese were kept from ever finding out if their balloon bombs were effective. The nuclear destruction of Hiroshima and Nagasaki brought the war to an end before the Japanese could send the Fugo ballons with bioweapons. Learning about all this has renewed my confidence in our nuclear decision to end the war. 2. Japan’s Unit 731 – One of the more infamous atrocity mills of WW II. Unit 731 was an officially sanctioned and funded bioweapons program / facility headquartered in Harbin, Manchuria. Headed by Shiro Ishii, Unit 731 has become synonymous with human experimentation for those who know of its existence. Experiments on human beings (or “logs” as they were referred to) involving live human vivisection, effects of frostbite, high altitude pressurization exposure to bioweapons, flamethrowers, and explosives were routine. These experiments included U.S. POWs. This Unit was the potential source of the bioweapons to be used for the Fugo balloon project. 3. Operation PAPERCLIP – The now well-known program begun under the Truman administration to bring Nazi scientists to U.S. soil for their knowledge and expertise. As Nick demonstrates, the program eventually included Japanese scientists. However, even prior to the “heyday” of PAPERCLIP, the U.S. government, with the approval of Douglas MacArthur, was soliciting and procuring Unit 731 scientists for their advanced knowledge of bioweapons and their effect on human beings. Nick marshals brief, but weighty, evidence that both Nazis and Unit 731 scientists who engaged in human experimentation made it into this country and wound up on the U.S. payroll. 4. Nazi Advanced Wingless Aircraft / the Horten Brothers “UFO” Development – This refers to the work of Reimer and Walter Horten, mainly toward the end of the war, to produce a flight-worthy wingless disk aircraft. Although models were tested and commissioned by the Luftwaffe in 1944-45, the war ended before the Nazis could more perfectly develop and mass produce the model. The Horten craft was discovered by the British, after which the Horten brothers were invited to Britain to continue their work. An agreement between the two and Britain could not be reached, and the Hortens returned to Germany in 1945. 5. NEPA (Nuclear Energy for Propulsion Aircraft) – This program focused on developing nuclear energy for the propulsion of aircraft. One of the significant obstacles with achieving the project goal was shielding pilots from radiation. Another problem was constructing a reactor light enough and small enough for an aircraft. A sub-problem for the testing involving the protection of occupants from radiation was that, eventually, human occupants would have to be put at risk. Redfern argues that, in the wake of the 1947 close of the Nuremberg trials—which called for the end of human experimentation—those involved in our testing program felt rushed to gain official permission to use human subjects. Attempts were made to procure legislation allowing human experimentation. Documentation indicates that, eventually, prisoners and mental patients from U.S jails and institutions were used, along with dead bodies snatched from morgues and hospitals without consent of surviving kin. This body snatching program was dubbed Project Sunshine. Of particular relevance for Redfern’s thesis is the documentary evidence that certain “specimens” were procured from Formosa, home of Unit 731. The intersection of all the above offered by Redfern can be briefly described as follows. Roswell was a PAPERCLIP screw-up. The “UFO” was in reality a wingless craft launched from a U.S. base in the southwest via a high altitude Fugo balloon. These craft were occupied by either a Japanese crew (no one over five feet tall) or human unfortunates being utilized for testing purposes. Two or more of these craft crashed at Roswell and other nearby locations, explaining the multiple site / multiple date problem pointed to by skeptics as conflicting (and therefore unreliable) testimony. The bodies were human, but physically unusual to those who discovered them. The victims were small, perhaps oriental, or perhaps unfortunates who suffered from progeria or Turner’s syndrome (which involved baldness, enlarged head, and even polydactylism). The UFO explanation was floated to the public to deflect attention away from the fact that Nazis and other Japanese war criminals were on our payroll. After the late forties, the UFO scenario proved useful for misdirecting the Soviets, and so the myth was continued. Redfern supports this reconstruction in a twofold way: actual de-classified documents and clandestine sources. My only criticism of the book pertains to a small point about the documentation, so I mention it here before proceeding. I would have liked to see Redfern give more details as to where he got the documentary evidence. That annoyance aside, in my view, he does a good job in laying out the details of the above reconstruction from his inside sources, and then proceeds to systematically corroborate data points with physical (documentary) evidence. For example, his book contains documentation for the adaptation of the Fugo program at U.S. military facilities (including a Japanese crew), a far-reaching program of radiation testing involving U.S. citizens as guinea pigs, procurement of Japanese war criminals from Unit 731 under PAPERCLIP, and human experimentation involving the handicapped, retarded, children, dwarfs, and victims of progeria. Redfern also adds some startling correlative evidence to support his reconstruction. For example, Dr. Lincoln Lapaz, long suspected to have been involved in the Roswell incident because of witness testimony, was actually the leading U.S. expert on Fugo balloons. There are of course others, even down to how these experimental programs were utilizing exotic materials that account for some of the more dramatic Roswell testimony—like metal that “remembered” its original shape. Space prevents more than passing mention of the details of such details. What does all this add up to? On one hand, there is strong documentary evidence for Redfern’s thesis. It is coherent and has powerful explanatory value. On the other hand, most of the specific connections to Roswell itself come from inside sources—witnesses to events who either want to remain unnamed, or who must be taken at their word. The question the reader will have to answer is whether this is sufficient for providing the “final answer” for the Roswell story. In my mind, this reconstruction covers every significant data point in the Roswell legend. All that remains is documenting each point. Nick has documented a number of the points, and so work remains. Not everyone agrees, naturally. (4) all the above was true in the summer of 1947. Apparently what Stanton wants is some sort of document that explicitly mentions all the above with the name Roswell at the right dates. Personally, his response made me wonder about two things. First, what non-alien explanation or body of documentary evidence would convince Stan that he is wrong on Roswell? I’m not trying to be cynical, but I can imagine him picking to death any document (or truckload of documents) that really did come clean about the whole thing if the final explanation wasn’t alien (“the use of the semicolon in this document makes me question its authenticity”). I’m not trying to impugn Stanton’s motives or character. He’s one of the few people in this field that I still think consciously try to operate with integrity. It’s just human nature when so much of one’s life is invested in a subject to want more evidence than is (perhaps) reasonably warranted before changing one’s mind. It’s normal. It should go without saying that the U.S. government has seen to it that no one will ever find an explicit record of what happened at Roswell. The close of the late Congressman Schiff’s attempts to get as much speak loudly in this regard. The alternative is that one must work with the pieces and ask if any other explanation has as much explanatory power. In this regard, I would hope Stanton would realize that the Roswell case does not the entire alien issue make. That brings me to my second musing. I also wondered what Stanton could offer to undermine the explanatory value of Redfern’s view (which I share). In other words, what does the alien view really have going for it, and how can it be defended against Nick’s work? We’ll take the negative aspect first. In his review of Redfern’s book, Stanton suggests that the whistleblowers Redfern relies on might turn out to be as bogus as others who have come down the pike. It’s a logical question, but it creates the impression that Redfern’s reconstruction depends on these sources when it doesn’t. While an explicit connection to Roswell does depend on these sources, Stanton’s criticism doesn’t disprove the thesis. It merely highlights a point that needs more evidence. These responses strike me as odd because of their methodological inconsistency. Stanton Friedman’s work has done much to certify the high degree of compartmentalization that exists in classified projects. Are we to assume that at the time he was working for GE and doing work related to Oak Ridge such compartmentalization did not exist, so that he had comprehensive knowledge of everything that was going on at that location? How is it that the documentation Redfern produces about shielding concerns contradicts Stanton’s assertion above? Did everyone at or above Stanton’s level on the project agree that radiation was not a shielding concern? How would he know if another team on the project had concerns or not? How does any of this allow Stanton (or us) to know what the concerns were in the late forties? Okay—radiation testing was also conducted to answer these questions. How does any of this tarnish Redfern’s thesis? Nick is clearly aware of the testimony of Major Jesse Marcel of what was observed on the Foster Ranch and of Barney Barnett in the plains of San Augustine. A big Japanese balloon and a Horton flying wing don't fill the bill. Most Horton craft were actually made out of wood, but there was nothing about the wing and balloon that matched the eyewitness testimony and the complete absence of conventional components as noted by Jesse -- nor the huge area covered by the small pieces of wreckage. Nick accepts the testimony of the late Frank Kaufmann about the shape of a saucer from north of Roswell. He seems unaware that Frank's original testimony about the shape seems to have been taken from a drawing on the cover of Popular Mechanics of the TR 3 airplane, and that Frank's testimony has been totally discredited, even by his formerly staunchest proponent, Dr. Kevin Randle. Several points of observation are worth making. First, it would be unwarranted to argue that no evidence of an experimental balloon was found at Roswell. Kal Korff’s work has demonstrated this, among others. I am not suggesting that Korff is correct on all counts—but I am suggesting that he isn’t wrong on every count. Second, while Stanton may be correct (and I do not know for sure) that “most Horton craft were actually made out of wood,” Redfern isn’t claiming that the Roswell craft was “an original Horten”—the claim is that the Horten design was brought here via PAPERCLIP scientists and other intelligence channels and adapted. This criticism is therefore pointless, as is the implication extracted from it: “… there was nothing about the wing and balloon that matched the eyewitness testimony and the complete absence of conventional components as noted by Jesse …” This only holds if one assumes a wooden craft. Third, I would like to know why Redfern’s Fugo balloon-plus-disk-shaped-non-alien-craft cannot account for the size of the debris field while a Friedman-disk-shaped-alien-craft a couple dozen feet in diameter can. Do aliens just pack more junk into their saucers? This objection seems incoherent. Lastly, it matters not where Frank Kaufmann got his recollection of the shape of the craft, or if he saw it at all. There are other witnesses who testify that they saw a disk shaped craft at the other crash site associated with the Roswell incident (cf. the bodies laying outside). If it was an adapted Horten disk, how would the recollection of others as to the curved shape undermine what Redfern is saying? The rejection of Kaufmann’s remarks is another red herring. This brings me to the “positive” angle of the alien view that opposes Redfern’s thesis: What does the alien view really have going for it? The answer, if Redfern is correct, is “nothing.” The answer in terms of where we are at now—living with the absence of an explicit document that might satisfy Stanton Friedman—is “not much.” The fact is that Redfern’s thesis can account for all the “alien” features already noted. The only item that even remotely stands in the way is the Majestic documents. Redfern does comment on these documents and suspects they are fakes, deliberately handed over to distract researchers from the real, horrible story he erects. Toward that end he makes some interesting speculations about the role of Bill Moore with respect to these documents and his role in the disinformation campaign against Paul Bennewitz. But speculations they remain. I suspect that these documents are not as much of an obstacle as one might think even if they are authentic. I doubt that these documents have ever been systematically searched with PAPERCLIP, its personnel, and its operational locations in mind. I am willing to bet that some of Redfern’s names, places, and programs would be found in these documents, and that these documents could be interpreted in a way that supports Redfern’s thesis. On the other hand, the documents may be fraudulent (in whole or in part). If they were subjected, for example, to stylometric linguistic analysis (and I do not mean forensic examinations of the kind that examines numbering styles, paper, ink, typewriter keys, etc. ), they may disappear altogether from the picture, leaving the alien view with nothing to commend it. But until that happens, if Redfern’s explanation for the bodies be allowed, the unusual anatomical features actually mentioned in the documents can be accounted for (eye covering, head size, extra fingers and toes, even genital anomalies). The fact is even the best of these documents is not terribly specific or forensically precise; they are just surface observations that cannot compel us to say with certainty that the bodies were alien and could not have been a human unfortunate of one of the types Redfern documents were used in human experimentation for radiation testing. So where does this leave us? In my judgment, Redfern has presented a compelling though imperfect and incomplete case that potentially has comprehensive explanatory value. Yes, I’d love an explicit document typing all this together, but even if one surfaced and really was authentic, there would be those who would refuse to believe it. What we do have is a quite plausible scenario for what happened at Roswell and the knowledge of what to look for to tighten the arguments. Just accomplishing that much means Nick Redfern has performed a valuable service.